It’s not always we get to talk of extraordinary offerings in the cooler market like the sovaro and coolers with speakers. Once in a while we do come across these things and can’t help but share it with you guys. And today is one of those few moments where we’d like to share something unique with our readers. Perhaps you’ve heard of them? Or maybe not? 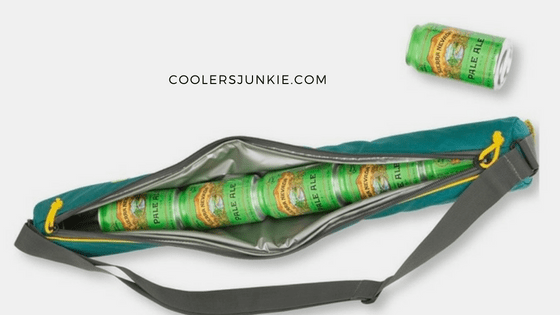 Tube cooler is designed to be slung like a quiver, only this time around it’s filled with cans, not arrows. Party warriors will resonate with the tube coolers as they provide easy access to your drinks without restrictions. Some of these can coolers can carry up to 8 cans, this will suffice to cater for you throughout the event especially when you can’t trust the fridge. The best part about using these insulated cooler tubes is the chic they have to get heads turned. You will surely get compliments that will blow you away. Finally, it is worth noting, despite the insulated design of the product, don’t expect extended ice performance from it. You should pre-chill your drinks before stuffing them into the sling bag. Stuff in real ice or ice sheets? No that’s a bad idea since ice is likely to melt and the seams can’t hold out water from leaking. It is advised you pre-chill the cooler tube and the drinks before loading your contents inside. There are quite a few good cooler tubes on the market, and you want to make sure that you choose the best quality. Here at coolersjunkie, we recommend only tested products by first-hand users before compiling the top products currently on the market. Coleman is one of the big brands of high-end coolers. They have lots of great products out there, and this soft can cooler is a testament to their astute design and pedigree. Incredibly cheap and equally great at executing its functions, it comes in two colors, blue and grey. Although the later has a steeper price tag. In terms of capacity, it can stack up 12 oz 6-cans of your drinks. The zipper on the Coleman co18 is one element that makes this cooler tube stand out from many others. It has a dual zippered design which opens from the sides for easy access to drinks. The Coleman includes an adjustable shoulder strap to help so you can carry it on your shoulder. As is typical with many cube coolers, they are designed to fit into tight spaces without much obstruction. The exterior is made from nylon fabric, while the interior makes use of a special liner. Thanks to the materials used on both the inside and outside making it easy to clean. The Mountainsmith cooler tube is perhaps the sleekest product on our list. It comes in many colors, and you might likely be spoilt for choice; Blueberry, Dark camo, hemp natural, high country, ice grey and otter brown. Unlike most of the products on the list, PEVA lining is used, the result is a waterproof sling tube. Additionally, it stacks up to 6 pack of 12-ounce cans. Moreover, it can hold 24-ounce cans as well. Zippered with tough 150D rip-stop nylon, you’ll appreciate the long-lasting zippers even after constant use. The shoulder sling is made of comfy materials that allow for great user experience. Sling it on your shoulder or strap it to your bag, you decide. Next up, is the most expensive cooler tube sling on the list. Of course, the price is worth every dime you spend on it. As you’d expect, the build material is excellent, and provides enough space for up to five cans. This cooler tube is insulated on the inside with neoprene and metal foil inner lining. The most incredible thing about the turtle river Cooler is the re-freezable ice pucks it tags along. Regarding capacity, it holds up to five cans with pucks and 6 cans without pucks. Simply slide the ice pucks between each can. This results to dramatic increase in ice life. It comes with a bonus kookier on the sling which is attached to the carabiner clip to allow for extra space for an extra beer. Those of you with a high taste in fashionable items, you may want to keep your eye of this insulated cooler tube from burton. Burton beeracuda is stands out simply because of its design. At first sight, you’d likely mistake the insulated can tube for a pile of can drinks mounted on each other. However, it also comes with different design and patterns that make it the most alluring product. Made of polyester, the feel and quality of the product are just amazing. This single barrel tube is designed to hold up to 5 cans. However, there’s the koozie that attaches to the shoulder strap that provides another space for an extra can. And there you have it. our top insulated can tubes in the market. These uncommon tubes will make a great gift to a friends or family. Yes, and the party warriors will love this too. Remember to invest in a good can tube and maintain it properly, so that it can last you a lifetime of parties, picnics and much more.